The Theoretical Chemistry Research Laboratory houses advanced computing equipment used for molecular modeling and ongoing computational chemistry research. The O.F. Stambaugh Chemistry Library houses chemistry reference books, textbooks, and journal holdings as well as a computer designated for library and literature searching. The library is open during the day and into the evening, during which time it is staffed by Chemistry & Biochemistry majors who serve as tutors for introductory and organic chemistry courses. The NMR Laboratory houses the department's superconducting Nuclear Magnetic Resonance Spectrometer. Acquired in 2010 with a National Science Foundation Major Research Instrumentation grant, the Varian 400 MHz instrument is equipped with a robotic autosampler capable of handling up to 96 samples. Students use the instrument in their research and in teaching laboratories throughout the curriculum for applications ranging from characterization of organic and inorganic products to monitoring of reaction kinetics and measurement of equilibrium constants. 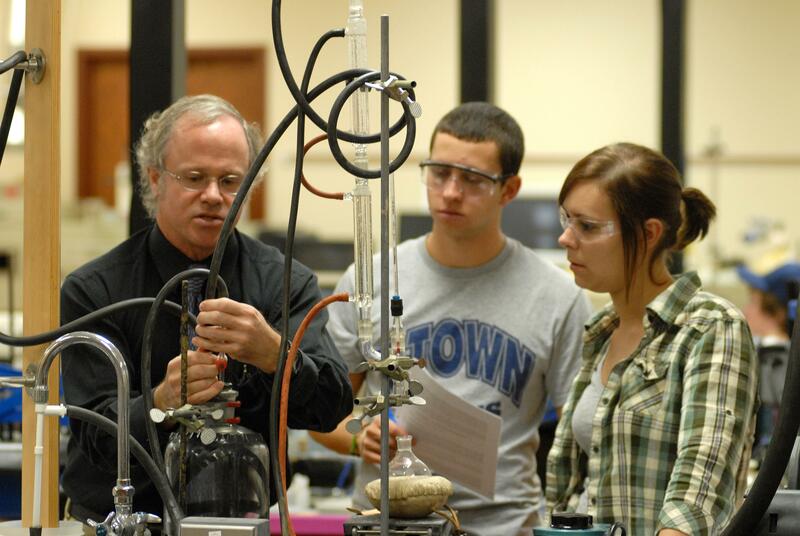 Elizabethtown offers a unique curriculum in which students begin Organic Chemistry the second semester of their first year. In the Organic Chemistry Laboratory, students conduct experiments that complement lecture material and receive training in the essential techniques of the field, which include use of fume hoods, completion of synthetic reactions, and characterization of samples by instrumental analysis. 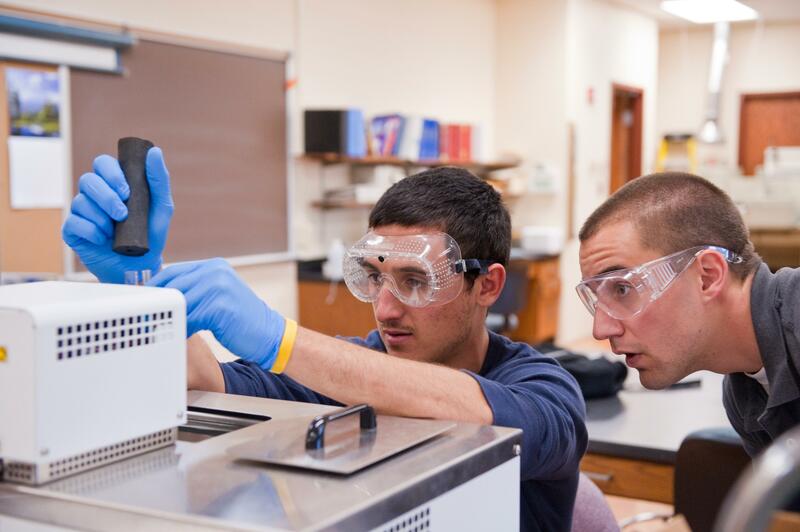 Each of 16 students in a laboratory section is assigned a fume hood, bench space, and laboratory drawer stocked with the necessary lab equipment. 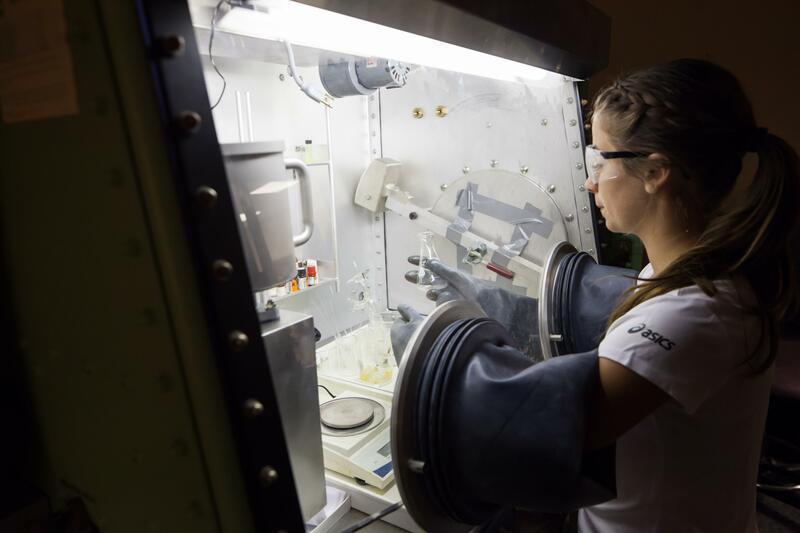 Fume hoods are located around the perimeter of the room with a glass enclosed space for instrumentation in the center, thus promoting real time analysis of reactions and affording high visibility to ensure students' safety. The Quantitative Chemical Analysis Laboratory is used for both the analytical and inorganic chemistry laboratory courses. Students in each class are given personal bench space and drawers for storage of chemical equipment. 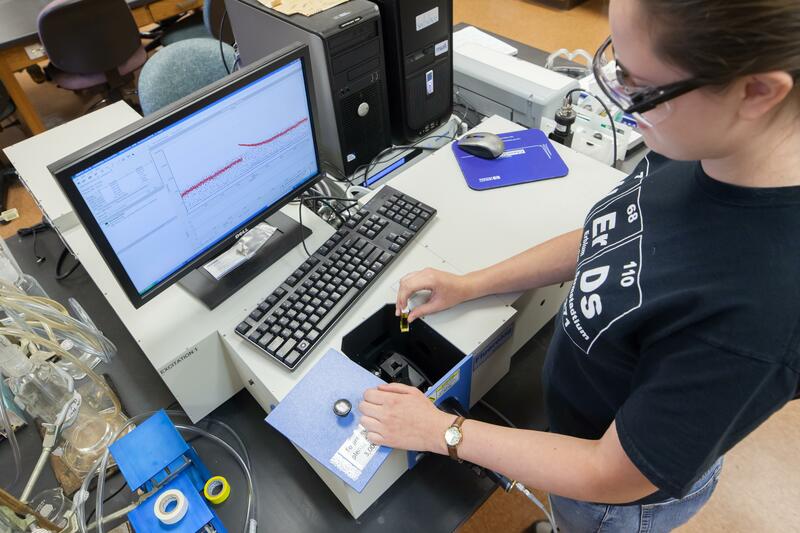 The lab is equipped with fume hoods, and courses in both analytical and inorganic chemistry make frequent use of hand-held, Vernier® data acquisition devices and sensors to perform a variety of chemical and physical measurements. 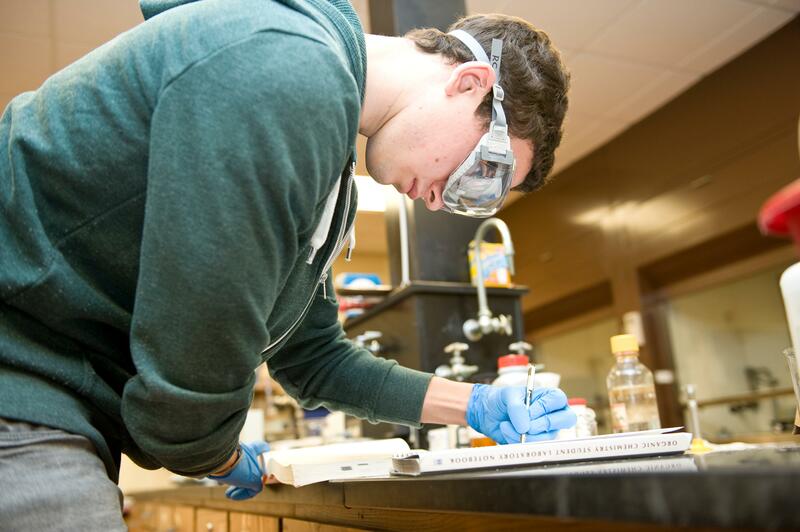 Introductory chemistry students perform experiments in the state-of-the-art General Chemistry Laboratory. Each student is assigned a personal bench space and laboratory drawer for storage of chemical equipment. The lab is equipped with fume hoods and a lecture space for pre-laboratory remarks and collaborative, post-laboratory data analysis. 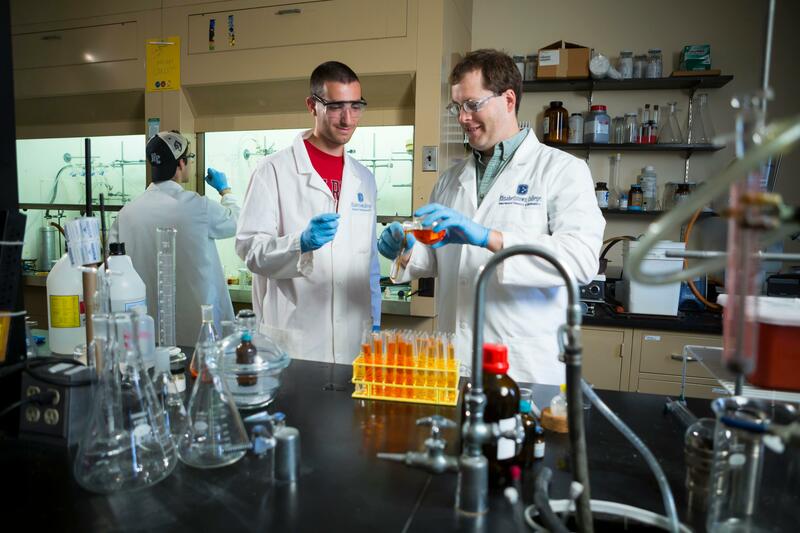 Laboratory courses of 24 students are taught by faculty members, each of whom is paired with a departmental teaching assistant from among the sophomore-senior classes. The Instrumental Analysis Laboratory houses much of the department's major instrumentation as well as fume hoods, bench space for wet bench chemistry, and a lecture area with bench spaces for student collaboration. Available equipment is used for research purposes, in the Chemical Instrumentation course, and throughout the curriculum. The Chemistry Computer Laboratory is home to 12 computers for student use. In addition to standard software, the computers run specialized chemistry software packages such as ChemDraw, Crystal Maker, LabVIEW, Maple, Mathematica, MatLab, and SciFinder Scholar. The Computer Laboratory is accessible by students during the day and in the evening hours while the Masters Center for Science, Mathematics, and Engineering remains open. In the General Chemistry Laboratory, introductory chemistry students perform a wide range of experiments which complement the material covered in general chemistry lecture. Aside from the fume hoods and benches, the lab is equipped with a separate lecture space for pre-laboratory remarks and collaborative, post-laboratory data analysis. Laboratory courses of 24 students are taught by faculty members, each of whom is paired with a departmental teaching assistant from among the sophomore-senior classes. Five Research Laboratories on the second floor in Musser Hall are devoted to ongoing student-faculty research. The rooms are equipped with fume hoods, ample bench space, cabinet and drawer storage, and student desks. Each room is uniquely stocked with the necessary equipment, glassware, and reagents for research in the area of specialty of the faculty research mentor.